4 Bedroom Semi Detached House For Sale in Sheffield for £170,000. Available to market having NO ONWARD CHAIN AND VACANT POSSESSION is this deceptively spacious and EXTENDED FOUR BEDROOM semi detached family home, boasting deceptively spacious accommodation over both floors and offering ample further potential for those looking to create a lovely family home to their own taste/requirements (subject to consents). 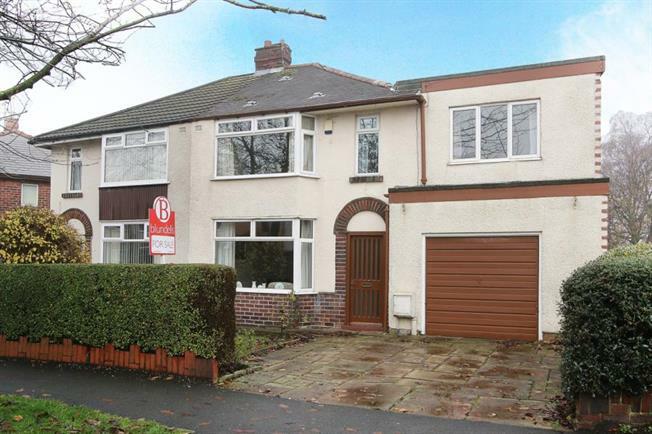 Offered for sale with the benefit of double glazed windows and Gas fired central heating, as well as being located within the popular residential suburb of Charnock, well placed for a wide variety of local shops/amenities, schools and transport links including the Supertram network. The accommodation in brief comprises: Entrance lobby with stairs rising to the first floor landing and a door leading into the front facing lounge, a door leads from the lounge into the open plan dining kitchen which provides a range of wall and base units along with integrated appliances to include: gas hob, electric oven, extractor fan and fridge. A door leads into a good size pantry and rear facing French style doors giving access to the rear garden. A courtesy door from the kitchen area leads into the integral garage where there is a utility area, providing space and plumbing for an automatic washing machine and tumble dryer, along with a rear facing door leading to the rear garden and a front facing up & over door accessing the driveway. First floor landing: Three double bedrooms all have built in Wardrobes providing ample storage, single bedroom four, family bathroom and separate shower room being fitted with a wash hand basin, low flush wc and walk in shower cubicle having an electric shower within. Outside: to the front of the property is driveway providing off road parking leading to the integral garage having up and over door, whilst to the rear of the property is an enclosed lawned garden with garden shed, having a pleasant rear outlook backing onto a communal park area.